The sale of the Paragon 95 motor yacht Tenacity yesterday brings the total number of sales so far in 2015 to 300 superyachts, nearly a month after the same benchmark was reached last year, on September 22nd 2014. 2014 went on to see a record 412 yachts sold but, judging by sales so far this year, the record is unlikely to be broken in 2015. And it all started so well, with 87 yachts sold in the first quarter of 2015 against 80 sales in the equivalent period in 2014. Notable sales in this period include Trinity’s 57m Lady Linda, Feadship’s 52.37m Calixe, Benetti’s 50m Aquila and the 49m Mim from the CMN yard. The second quarter saw the market soften considerably with 112 sales compared with 146 in Q2 2014. The quality of yachts sold, however, remained high as the 61m Lurssen Aurora, 60m Benetti Bistango and 55m Amels Engelberg left the market. In quarter three the market basically flatlined, seeing 88 sales versus 92 in Q3 2014, although it did record the largest sale of the year in the shape of the 72m Stella Maris, built by Italy’s VSY yard. 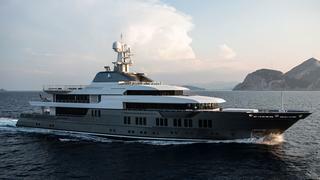 Other significant sales included the 55m Nishi Bannenberg and Delta Marine’s 50m Arianna. As always it was gratifying to see a number of older yachts sold, making way for newer inventory and here mention should be made of the 32m Sea Monster, built in 1953 and, the oldest motor yacht to be sold in 2015, the venerable 47.96m RS Eden from 1930. The obvious question to ask is: have 300 sales had a significant impact on the huge overhang of yachts on the market? The answer is: not really, for in the same period a further 272 yachts came on the market, shrinking the global inventory by just 28 yachts.